A glow in the dark soother knob that ensures that you or your little one can locate their soother in the dark. Comes included with a travel case that can also self-sterilise your soothers by just adding water, inserting the soothers and microwave for 3 minutes. Mother & Baby Awards 2007/8 Gold - Award for Excellence. Orthodontic. Steriliser & travel box. Steriliser box 3min. Developed with medical experts. 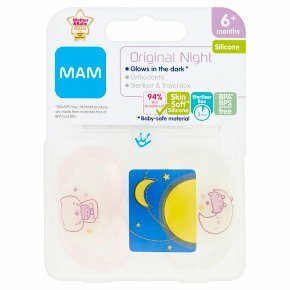 Glows in the dark* *Baby-safe material BPA° Free °BPA free: All MAM products are made from materials free of BPA and BPS. Shield Curved for maximum comfort Skin-friendly thanks to big air holes & unique MAM dimples on the inside Skinsoft Silicone Easily accepted by babies For a familiar feeling Glow-Button Button glows in the dark, so parents & babies can find it easily 10% baby-safe material MAM Design Symmetric shape, always fits perfectly in baby's mouth Designed with dentist for a healthy dental development MAM Soothers are the result of our close collaboration with paediatricians, dentists and orthodontists. Comfortable for babies, reassuring for parents and with a familiar teat feeling. The special teat and shield design ensure a perfect fit and skin-friendly shape 94% Teat Acceptance* Proven effectiveness: market research confirms that 94% of babies accept the MAM Skinsoft Silicone. (*Market research 2010-2014, tested with 1,236 babies). For your child's safety<br>WARNING!<br>Inspect carefully before each use Pull the soother in all directions. Throw away at the first signs of damage or weakness. We call this the pull test.<br>Only use dedicated soother holders tested to EN 12586. Never attach other ribbons or cords to a soother, your child may be strangled by them.<br>Do not leave a soother in direct sunlight or near a source of heat or leave in sterilising solution for longer than recommended, as this may weaken the teat.